Home DOST Mayon Volcano PHIVOLCS MAYON Volcano now at Alert Level 4, January 22, 2018. 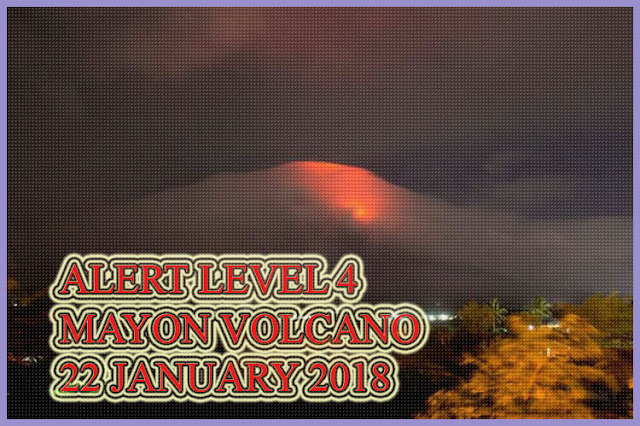 MAYON Volcano now at Alert Level 4, January 22, 2018. ANNOUNCEMENT: Notice for the raising of Mayon Volcano’s status from Alert Level 3 (increased tendency to hazardous eruption) to Alert Level 4 (hazardous eruption imminent). This serves as a notice for the raising of Mayon Volcano’s status from Alert Level 3 (increased tendency to hazardous eruption) to Alert Level 4 (hazardous eruption imminent). Mayon Volcano in Albay Province has been exhibiting increased seismic unrest, lava fountaining and summit explosions. In view thereof, DOST-PHIVOLCS is raising the Alert Level of Mayon Volcano from Alert 3 (increased tendency to hazardous eruption) to Alert Level 4 (hazardous eruption imminent). Because of this, the Danger Zone is extended to 8 kilometers radius from the summit vent. The public is strongly advised to be vigilant and desist from entering this danger zone. Civil aviation authorities must also advise pilots to avoid flying close to the volcano’s summit as ash from eruptions can be hazardous to aircraft. DOST-PHIVOLCS maintains close monitoring of Mayon Volcano and any new development will be communicated to all concerned stakeholders. Job Fair List for February 2018 in Davao Region. Job Fair List for February 2018 in Central Luzon. - La Niña will still bring much rainfall during the first quarter of 2018.